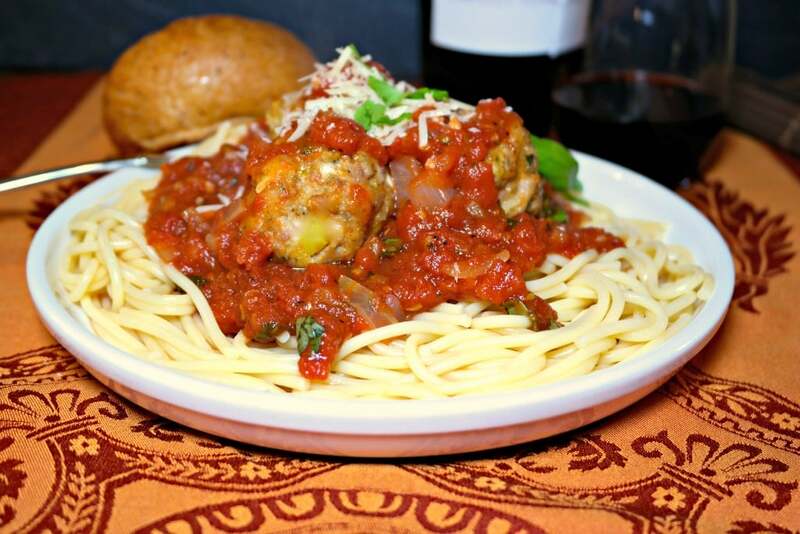 Turkey meatballs made with a mix of dark ground turkey and Italian sausage turkey links. Keep the dish classic and serve with spaghetti or try something different and enjoy them with broccoli slaw. Traditional Italian recipes are harder to come by then you might think. Probably because what one family considers a classic, another would create entirely different. 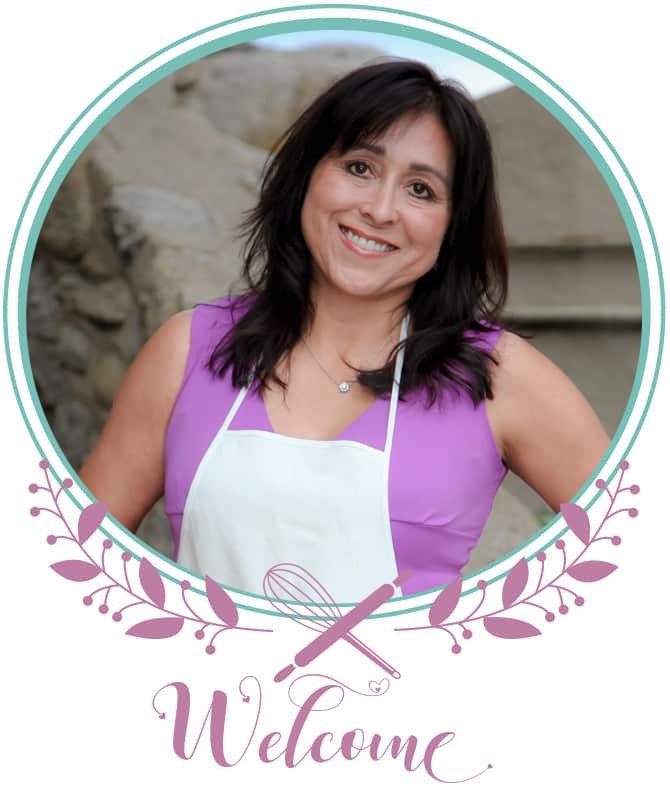 There is one common thread though, regardless if you use fresh bread or dried breadcrumbs, milk or wine in your meatball recipe; you’re making the meal with lots of love straight from the heart…and hands! You gotta get foundational by diving right in the meat mixture, blending the ingredients and forming each meatball! Some will tell you to use an ice cream scoop to form your turkey meatballs. Don’t bother getting another kitchen utensil dirty. Pour yourself a glass of wine and each time you wash your hands between rolling and stirring the sauce, take a sip. That routine will equate to at least one full glass while making this meal. Be sure to refill your glass again while the sauce simmers. My husband, son, and son’s girlfriend ate their meatballs with spaghetti, but I was craving some veggies and thought I would try something different for myself. I served my meat over lightly stir-fried broccoli slaw. LOVE the combination! 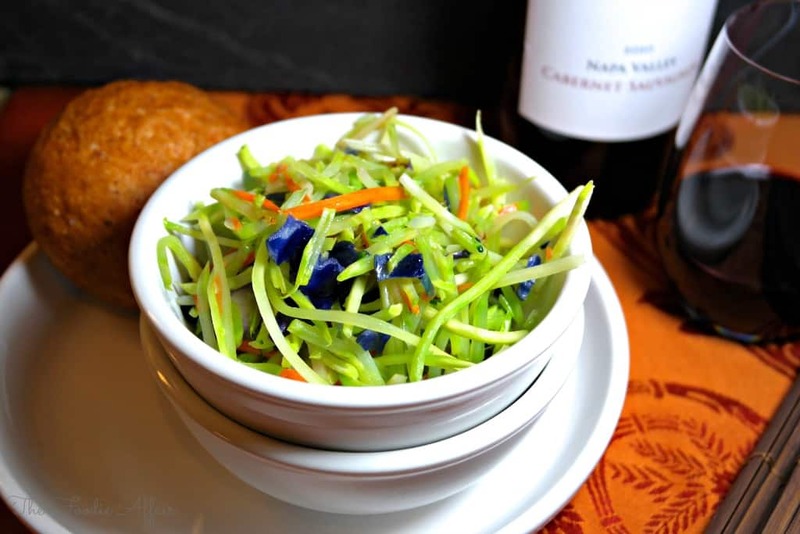 I used pre-packaged Mann’s Broccoli Cole Slaw, which is genius product for me since I would never be able to chop my broccoli into perfect matchstick pieces! Plus, I banned myself from ever touching a mandolin slicer or having one in my house after I nearly took my finger off slicing a tomato! To prepare the slaw, all I did was on medium heat stir-fry the slaw in some olive oil just until it began to slightly soften, still holding its form. That was it! It was still firm, so believe it or not, eating it resembled the same texture as pasta! 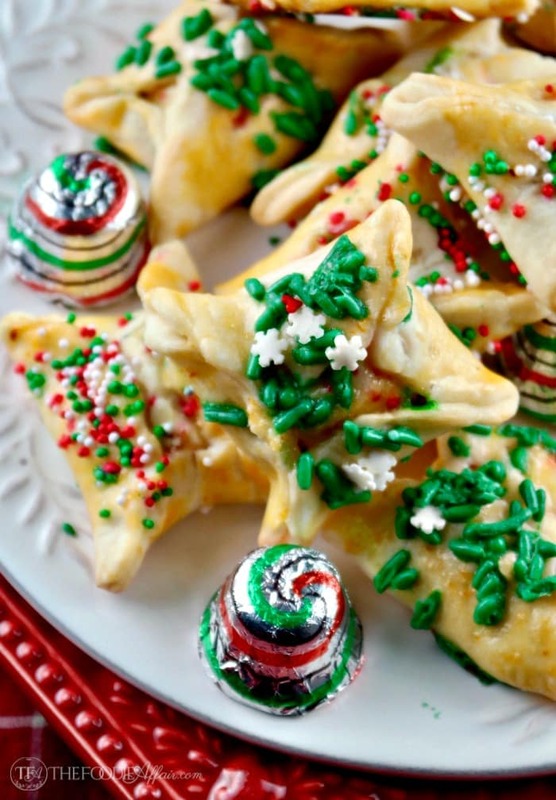 Preheat oven to 400 degrees and line a cookie sheet with foil and lightly spray with non-stick cooking spray. Set aside. Cook sauce first to let flavors blend as long as possible. In a large deep skillet over medium high heat warm the olive oil. Add the onions, garlic salt and pepper and cook until onion is limp and fragrant. Add 1/2 cup of the basil, fennel, oregano tomatoes brining to a simmer. Cook over medium heat stirring occasionally while preparing meatballs. Stir in remaining basil and wine (optional) when adding meatballs. For the meatballs, in a large bowl blend together the breadcrumbs, parmesan cheese, basil, parsley, milk, tomato paste, salt, pepper, eggs, garlic and onions. Add the turkey meat and sausage gently mixing into the breadcrumb mix with your fingers until combined. Form the meat mixture into 1 1/2-inch balls (approximately 24). Place meatballs on prepared baking sheet and drizzle olive oil on top. Bake until cooked for 12-15 minutes. Once cooked add to sauce. Serve with spaghetti noodles or for a carb-free option, steam or stir-fried broccoli slaw. Recipe adapted from Food Network with Giada De Laurentiis. Meatballs are very common in Greece too. We bake them, fry them and put them in red sauce too! We usually make them with ground veal but I love your turkey ones. Much healthier! I pretty much love all dishes with sauce. 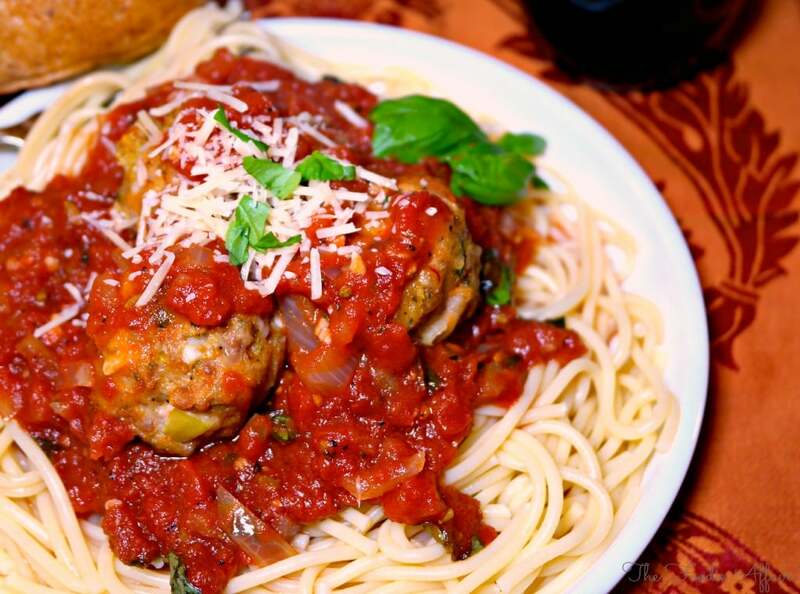 These meatballs are always a hit in my house! Would love to taste the Greek version too! Your meatballs sound terrific, Sandra and I would enjoy them served either way. Thank you, Karen! I really enjoyed the broccoli slaw, but a good plate of pasta is hard to pass up! Serving the meatballs ontop of broccoli slaw is genius! Love this idea. When I eat pasta, more often then not, I mix in some arugula or fresh spinach. Both taste so good with italian flavors! 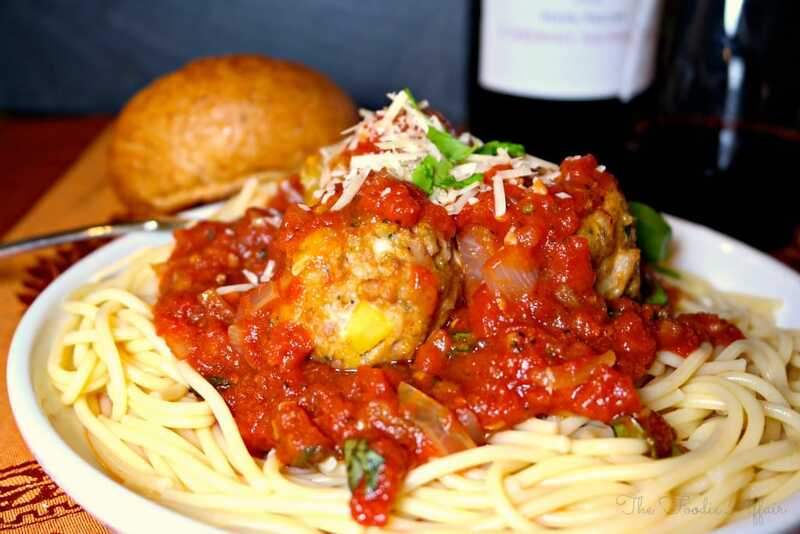 Love this classic meatball recipe too! Thank you, Renee! I love to add veggies and this recipe got an extra dose! 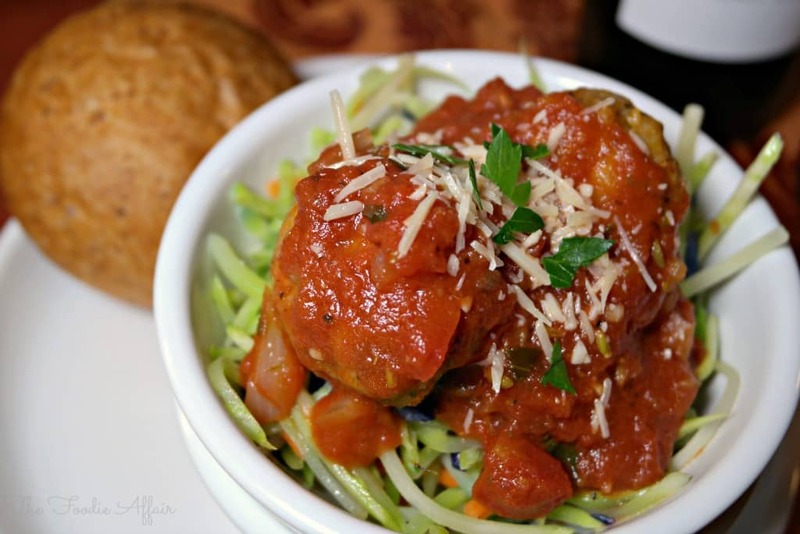 I love, love the idea of serving meatballs over slaw! I love spaghetti squash, too, but it’s not always available. Great tip! Oh, spaghetti squash has been on my list to try! I bet it’s tasty too! I really love the flavor combinations in this. Yum! G’day and don’t these look healthy and yum Sandra! Thanks, Brandi! I love using turkey. The turkey sausage really adds a lot of flavor too!